my customers love the new column profiling feature in Power Query. With the GA today, it is even better. One thing I have been asked for a few times now is the ability to export the column profile data as the result of a query. Ideally this could be exported to Excel for further investigation, or simply return it to ta table in Power BI for further investigation. We need a way to display data in our local timezone accounting for daylight savings time. The data source stores the dates in UTC but we need reports to show local time. A native and easy way to do this in PowerBI would be a huge help. There are many blog posts and help articles floating around with solutions people have attempted but it's a simple issue that so many users would benefit from having solved centrally by PowerBI itself. Please consider! All the code generated using the Power Query UI is so literal, it feels like I'm interacting with a dumb kid. If I'm selecting all columns and, say, trimming them, why hard code all the column names? It makes code hard to re-use and brittle, which generates a lot of menial code editing overhead. Incremental refresh works good when refreshing data from tables. We have to deal with complex logic and predefined structure which is not possible from tables. Incremental refresh from stored procedure will be very helpful. While renaming query steps (right-click rename OR right-click properties) when you apply the name change, it will re-run the query step. Why? Best practice to rename query steps yet for very large data sets this becomes cumbersome during the queries initial development. Note: I could be missing something valuable that would prevent this, please advise. There should be an option to disable "see records" for the graphics that support it. It is a huge issue when it comes to security. I know you can hide certain columns but in reports that should only be high level data, the see records item is really an issue. The recently introduced Column Quality feature in the Query Editor allows us to identify Valid, Error and Empty values in each column. It would be great if we could quickly and easily remove all columns that only contain Null/Blank values. I recently had a situation where I'd loaded a table containing 100 or so columns into the Query Editor and I had to manually work through these removing all such columns - which was at least half of them. Having such a feature avaialble in the Query Editor wold be fantastic, and it may also be useful to have something very similar in the Data View which hides all such columns. The SAP HANA DirectQuery does not support data prep features like changing data types as well as other formatting changes. Without the ability to prep the SAP HANA data with DirectQuery, there is no way to leverage SAP HANA's real-time data capability. Thus, whenever a user needs to change data, they are forced to use Import (a static data set). In the current relationship view window we can delete a data table from the model. It would be nice to right click on the data table and click edit query for the underlying table. This would immediately open up the query editor for data table changes. Today you have to switch views to the table view, and click edit table. or navigate to the edit queries button and click edit queries. Doing this opens the queries, but you still have to navigate to the table you want to change. Recently some Column Quality and Column Distribution checks have been introduced into the Query Editor, which are great. A useful addition would be identifying Foreign Key values for which there's no corresponding Primary Key. A simple and common example of this would be identifying Customers who appear in the Sales fact table who don't appear in the Customer dimension table. The join created by the developer would identify the Foreign/Primary Key relationship, and perhaps any such orphaned Fact table records could be highlighted against the join itself. Currently such occurrences of this will usually result in Sales values posted against blank Customers in reports. The Customer value from the Fact table would have to be brought into the report to identify the missing Dimension table records. PowerQuery throws this odd error in some cases when a query references another query. Instead of the error, it should prompt you to select the correct privacy setting. 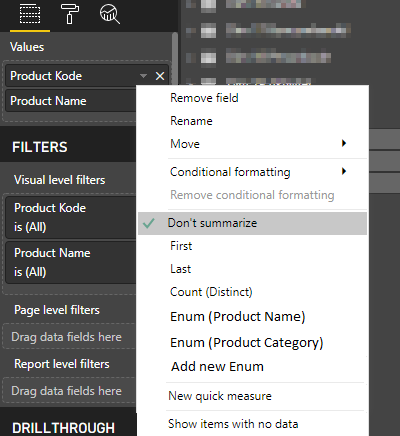 Instead of using the generic "Added Custom" or "Added Conditional Column", rather insert the column name to make it easier to navigate through the step logic. For example if I add a conditional column called Turnaround time, it is far more useful for me to see that I added Turnaround time than for me to see what type of column I added. It saves time that is waste having to manually rename those steps and also means that if one of my colleagues works on the model, they can easily identify important items without having to go through every addition to find the right one. I propose that this is only for added columns though as it wouldn't be practical for changes that affect multiple columns like name changes or removals. Create the ability to link dashboards and reports from different apps to another app and see the most up to date dashboard/report version on both apps. Those dashboards have to be saved to multiple apps which opens up the possibility of users not seeing the latest version if not managed well. Users must navigate through multiple apps to see each dashboard and report which causes frustration and information overload. Share each individual report or dashboard with each individual which requires a large amount of maintenance effort. Creating the ability to centralize and link previously created dashboards and reports would allow individuals to filter and select what information was important for their specific users to see and eliminate additional effort and time being expended to the either recreate dashboards, continually sort through a large amount of unnecessary information, or manage large lists that need to be continually modified of users or dashboards and report locations. Currently it is possible to create calculated columns in DAX as well as to add columns through Power Query. But for every column we add, our models get more bloated while the user interface gets more cluttered. I propose the addition of an enumeration type that is only evaluated at run time, this would reduce the file size of models by only requiring the developer to store references to values once. It would make possible to handle translation of the value in a secondary lookup table, thus eliminating the need for a complete re-evaluation of the column every time the lookup table is changed. A COUNTIF is sorely missed in DAX. Text wrapping on a line-by-line basis within Advanced Editor. Currently you have to manually enter a carriage return and tab it over to format. I often get requests that are derivates of already released reports, but require small tweaks, such as a new dimension to be added to answer. Being able to add composite table to a live data set connection would enable me to more effectively re-use my work, as I wouldn't have to start my project in an already complex pbix file. just a live connection, a look up table an a blank canvas. I have an r script to exports a staging query of historical data to CSV. This works fine in power bi desktop. It would be great if this was capable once published. Currently get zero errors, however no export to be found. I am trying to use this to retain past power bi refresh history as the API is only returning recent results.